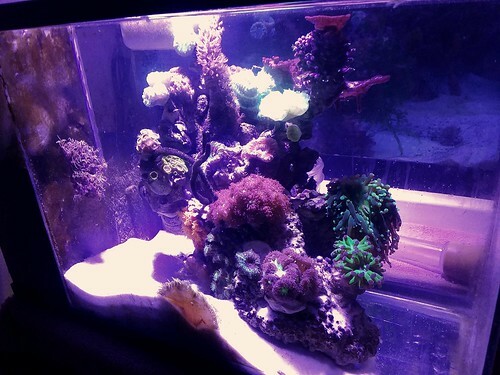 [QUOTE=vlangel;25499366]In an effort to control multiple tank syndrome (I had 3 tanks set up), I consolidated a 5.5 gallon pico reef with the QT. I moved the 10 gallon QT to next to the seahorse DT and put the contents of the 5.5 reef into the 10 gallon. Now I have an attractive QT and when there are not fish in it, it should be just as easy to maintain as the 5.5, which was super easy. Is “ multiple tank syndrome “ contagious, because I am an “addicted reefer”. Sometimes you gotta thin the herd to keep the peace. Good job! You funny girl. Thank you for the laugh. Laughter is good medicine! We all can use more of that. Yes, keeping peace is paramount. I love the video. Those striped fang blennies look really cool. Looks like they make for nice dither fish, hanging out in the middle water column. Sorry that the lined blenny didn't work out for you. Bummer. Thanks Kevin. The video was a bit long but I wanted the viewers to get a feel for the movement in the tank. Its my justification for getting the fish because except for flirting and food the seahorses do not do a lot of moving. Its ok that the lined blenny is in the QT. He is quite cute in there and still enjoyable. Sadly on fish news is both bangaii cardinals disappeared this past weekend. They appeared to be doing well when I transferred them from the QT but then they quit eating and then just disappeared. I am sure they died but I moved all the coral, macro algaes and rock that did not hold up the retaining wall and I could not find bodies. That is of some concern because even though they were tiny, they could grow pathogenic bacteria and probably will. Well, unless the peppermint shrimp and army of micro brittle stars polished them off. I am doing WCs every day to reduce the density of pathogenic bacteria. I really hope that does not create a problem for the ponies. I will be watching them closely. Today is the 2nd anniversary of the start of this tank. Yesterday was the 4th anniversary of me keeping Eve, one of my 1st seahorses. There has been quite a learning curve in these years and I still don't know everything! you previously mentioned how you assisted ponies immune system with reduced water temperature which would also reduce bacteria production rate. Do most of those bad bacteria prefer lower oxygen areas as opposed to free swimming in the water column. I had to wipe the tears of laughter from “multiple tank syndrome”. I agree, laughter is good for what ails you and if nothing ails you, then you should feel blessed. Thanks Michael. Keeping Eve for 4 years is very rewarding. Many seahorses don't make it much past their 1st year in an aquarist's tank. Right now I am very blessed to be in such good health. My hubby keeps me laughing even after 37 years of marriage so thats another reason I am blessed. I don't know for sure about the low oxygen but most are not free swimming. They populate in areas where there is excess uneatten food or detritus laying around. Usually that is at the base or crevises if rock. They enter the seahorse through the gills, cuts or abrasions to the skin ( which would have to be in the water column) or on decaying food and settle in the gut. Seahorses are very vulnerable in these 3 areas. All of you guys are really inspiring me. Michael, I loved your last build and am closely following this one. Your fake wall totally intrigues me and I am interested in an easy seagrass as well. Kevin, I really appreciate your imput on blennies. I am really loving mine. As the barnacle blennies grow bigger and I see how successful I am with them I would love to have a whole community of them. Patrick, I love that huge coral rock that dominates the left side of your new tank. 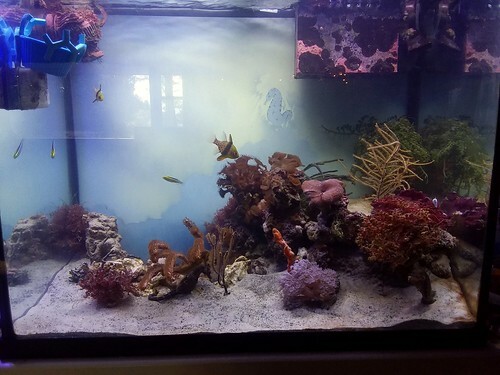 To me it is so aesthetically pleasing with coral and macro adorning it that I plan to imitate it when I redo the seahorse garden and turn it into only a fish garden. Some things I can do now and some will need to wait until my ponies live out their natural lives. For those of you who have followed my tank, you already know that I have purchased some blennies that will go into the garden tank. 3 of those 5 blennies are not in with the seahorses due to size or aggressiveness toward the ponies. Its my hope to reunite all the blennies someday. I would still like to add a pair of yellow head jawfish and some gobies, maybe a green citrinis, greenbanded and/or rusty goby. I would like more variety of macro algaes. Right now my tank seems to be too clean to keep some varieties. I will keep the tank dirtier when I do not have ponies anymore. Here is a pic of my tank as of yesterday. I added more sand in preparation for jawfish. I will add some rubble rock for them to construct their burrows. I kept a pair pearly jaws for a while, until one jumped out of the tank. Mine found a tiny hole and get out, and I don't know how it got out, but it did. The other one lived for about a year longer. I had plenty of sand and rubble, but it seemed like mine never stayed in one hole long. And, they just dug under the coral most of the time, rarely making their own hole, as I had hoped. After that, I tried a single dusky jawfish, and it was a great fish. It stayed in the same hole almost its entire life. It lived over 3 years. It constantly found rubble to line its burrow and decorate the top. I only wish that I had more than one so I could watch their antics together. Maybe I'll do a species tank one day. Bluespots appeal to me too, but they are more of a coldwater species, I think (or room temperature maybe). I'm not saying that pearly jawfish wouldn't work, just that my luck wasn't as good. When we visited Myrtle Beach, we saw two in the reef tank at the Ripley's aquarium and they both had nice burrows out in the middle of the sand bed lined with rubble. So, my guess is that with the right conditions, they'd be entertaining. They certainly are a beautiful fish! Your tank still looks fantastic! Glad the blennies are doing well! Kevin, are the pearly jawfish and the yellowhead jawfish the same specie? I was planning on the yellowhead because KPAquatics has them and I wanted macro algae and ricordia from them too. I had to remove the ponies last week from the 56 gallon because of skin infections. They are in a HT being treated with Triple sulfa and doing well. I am going to put them in my original seahorses tank a 30 gallon XH and hook it up to the sump. The 56 gallon tank will house all the blennies and the 2 tanks will be side by side. More details to come. I hope it goes well. Good luck! Yep, same species. Sorry to hear about the ponies getting sick. Hope they heal up quick for you. Actually only Samson and Delilah had infection but I figured that I had better remove Eve as well or she could be next. They are eating heartily and I have had excellant results with Triple sulfa in the past, so I feel very optimistic about them making full recoveries. Thanks Kevin for the info on the jawfish. I will definitely keep a dusky jawfish in mind. Yeah, sick ponies is never fun or convenient but seahorses are very treatable, especially when it is caught early. I feel hopeful that they all will make a complete recovery. Yesterday was spent getting the 30 gallon XH ready for the seahorses when they come out of HT. I painted the bottom glass so the tank can be bb. I oringinally had the back painted black but I removed that and painted it to match the 56 gallon, (minus the seahorse). The 30 gallon tank has oak colored trim and stand so I painted part of the stand to match the 56 gallon tank. It will not be a duplicate but it should at least look tied in decor' wise. 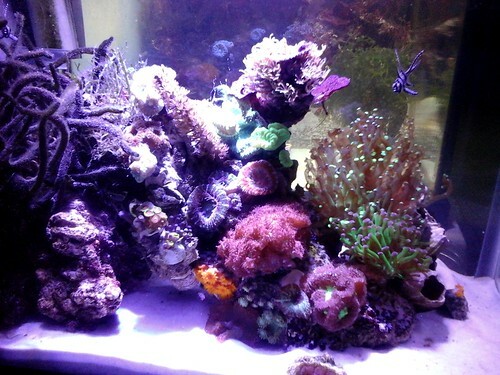 I am also cycling a new rock/coral structure that I want in the 30 gallon seahorse tank. It will be primarily a macro algae display with only a few hardy coral that I don't want in the 56 gallon blenny display tank. Last edited by vlangel; 10/23/2018 at 05:54 AM. This is an exciting development! Setting up another tank gives you the freedom to do whatever you want. Have fun with it! I am excited Michael. l can't do anything with a fake wall yet because I need both tanks as soon as the ponies come out of HT. Still it's fun to have the blennies and ponies without compromising either of their needs. Tonight I did get both tanks in place. The 56g is now an AIO. The 30g has been hooked up to the sump. The rock formation I made for the seahorses is in the tank cycling. I am expecting it to be fast because it is connected to an established sump. I was thinking the same thing, lots of options for you! I like the way that you painted the background of the 56g. I predict that your new build should look fantastic also. Your 'scaping skills are very good as well..